Indications: Inhibits proton pumps to reduce the amount of acid produced in the stomach. Commonly prescribed or suggested for patients with gastroesophageal reflux Disease (GERD), heartburn and ulcers. Summary Recommendations: Prilosec will not provide immediate relief for heartburn. Prilosec should be taken no longer than 14 days every four months. If symptoms resolve before treatment is complete continue taking the medication as suggested for the full treatment time. General Precautions: Prilosec is available over the counter and by prescription. Patients are generally prescribed a 14-day treatment every four months, if using Prilosec over the counter medication. Your doctor may suggest waiting longer than four months between treatments or suggest a different treatment protocol if a prescription dose is needed. Patients with difficulty swallowing, bloody stool, chest pain, difficulty breathing with heartburn, stomach pain, nausea or osteoporosis should consult a physician before taking Prilosec via prescription or over the counter. Prilosec may increase your risk of bone fracture if you take the medication for long periods. It is important to tell your physician about all medical conditions, especially bone disorders, before taking the medication. In some cases Prilosec may be suggested as part of a combination therapy including dietary changes and antibiotics. Follow the treatment plan as prescribed for complete relief. If you still suffer heartburn or symptoms after taking Prilosec for 14 days or longer, you may need a different medication. Effects While Trying to Conceive: Animal studies of up to 56 times the normal human dose showed no effect on fertility or reproduction. Human studies have not been completed, but the drug is not likely to affect human fertility. 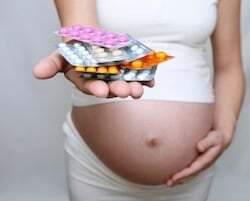 Effects on Pregnancy: There have been no human studies completed on the effect of Prilosec on pregnancy or fetal health. Animal studies have shown evidence of lethality to embryos and fetal toxicity. Animal studies are not necessarily reflective of effect in humans, but due to the potential for side effects Prilosec should only be used during pregnancy when benefits outweigh risks. Prilosec has been successfully given to women hours before birth for the prevention of Mendelson’s syndrome. Mendelson’s syndrome occurs when pregnant patients aspirate blood, gastric juice, water or bile after having anesthesia. Safe During Breastfeeding: Prilosec has been given to infants at doses of 1 mg/kg daily. While the drug does pass to the infant via breast milk, the amount ingested by infants is estimated at about 3 mcg/kg daily – a fraction of the prescribed amount. There have been no reported side effects in infants breastfeeding to mothers using Prilosec.